Tracking timesheet hours vs hours invoiced is crucial for a companies cash flow. See this question submitted by a reader. Hello Experts, I’m looking for a report so I can compare hours reported via the timesheet or really hours that have been paid out Vs. the hours that have been paid for or Invoiced. I’ve also noticed it is possible to add time to timesheets that have already been billed. Is there a way to prevent this? 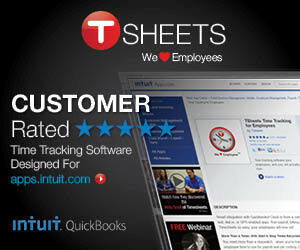 QuickBooks has some good time tracking reports, here are my recommendations for some reports for you to look at. The Time by Job Detail Report is available in all versions/flavors (Pro, Premier, Enterprise); access it from the Reports menu -> Jobs, Time & Mileage. If you don’t see a Billing Status column, click the Customize Report button and on the Display tab, check Billing Status. Once the Billing Status column has been activated you can tell if the time is billable, not billable, or has been billed. If you are using the Premier Contractor or Enterprise Contractor versions, check out the Billed/Unbilled Hours by Person and Job Report; access it from the Reports menu -> Contractor Reports. This report is very easy to read as it has columns for Billed, Unbilled, and Not Billable – which makes it very easy to read. No matter what version of QuickBooks you are using, you might want to check out some of the Contributed Reports – accessed from the Reports menu. These are custom reports that have either been created by Intuit or other QuickBooks users just like you, and you can download and import the report template into your own version of the software. Yes, it is possible to add more hours to a timesheet after you’ve created paychecks and after you’ve pulled unbilled time into customer invoices. This feature has it’s good and bad points, unfortunately. It’s great if you discover that you didn’t enter all of an employee’s time and shorted him/her in their paycheck and want to get those missed hours into your job costing reports. As for preventing someone’s ability to enter time after the fact, in Pro or Premier you could edit various user accounts and on the Time Tracking window, set their status as No Access – which means that the user in question would not be able to access any of the time tracking functions at all – including the ability to create reports (so you do want to be careful with these settings). Another thing that you could do, is to set a closing date password after you’ve pulled billable time into Invoices. That way, you would be the only one who could modify any existing timesheet entries by providing the closing date password. I “think” that in the Enterprise versions you have more flexibility with these specific settings – unfortunately I don’t have Enterprise installed on my laptop so can’t check it out for you at the moment. You’d need to enter Estimated hours into your Estimate. Hello, I need to create a report for estimated man hours vs. actual man hours. I understand where the actual hours come from, but I have no idea how to enter the estimated hours and have them pull on a report.